We have five Boxer Fun machines in assorted colours for sale at clearance prices. They are currently in storage in Brisbane, Australia and are ready to be put on location. Each unit features a Microcoin SP coin validator programmed for Australian coins. 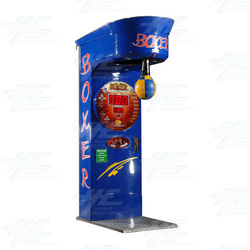 Boxer Fun are high quality boxing machines that measure the strength of players' punches. The machines feature a Boy/Girl switch setting to ensure accurate results and a fair competition. The cabinets utilize a flat, solid metal base for maximum stability and the punch ball is made from a foam filled leather casing. They are high income machines and are suitable for a variety of locations due to their durable, weather proof construction. Please contact our sales team for pricing and information.